Much like theater, film and television get together for a couple of nights to celebrate their best work over the past years, the internet industry also has a slew of awards that are given out to the best websites created year after year. 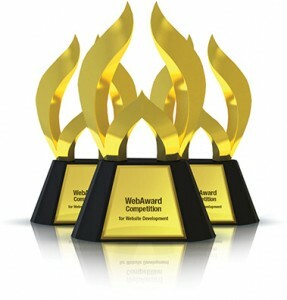 With traffic of two million visitors a month, the FWA claims that it is the most visited website award program. The FMA bases its results on these factors: Design (40%), Navigation (25%), Content (15%), Graphics (15%), and Personality (5%), and thus puts up the Site of the Day, of the Month and of the Year on their site. One more award is the People’s Choice Award that is awarded based on the online people vote. With the objective of encouraging innovation and excellent in website design, the Interactive Media Council, a non profit organization of web developers, designers, advertisers and other web professionals seek to offer the winners a boost in marketing and exposure. The awards are annual, and the factors for deciding winners are Design, Usability, Feature Functionality, Content, and Standards Compliance & Cross-Browser Compatibility across a hundred categories. While being one of the oldest awards for the industry dating back to 1997, the WebAwards grants annual awards to websites in 96 categories for which entries are encouraged. These entries are based on factors such as Design, Innovation, Interactivity, Content, Copywriting, Technology, and Ease of use, and are given equal weight.